SEOUL: South Korea's disgraced ex-President Park Geun-hye was being questioned Thursday by a court that will decide if she should be arrested over corruption allegations that have already toppled her from power. Live TV footage earlier showed a stern-looking Park entering the Seoul Central District Court building amid a barrage of camera flashes. She did not comment to reporters. The court is expected to decide by Friday morning whether to approve her arrest. 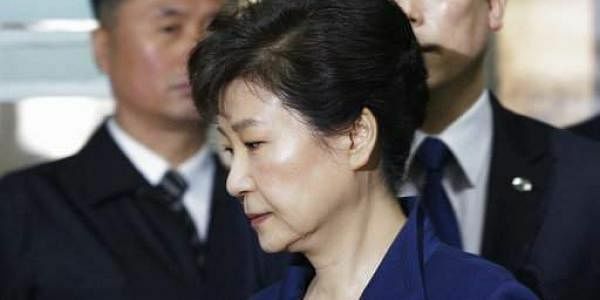 If the court approves the arrest warrant requested by prosecutors, Park will be immediately sent to a detention facility as prosecutors can detain her for up to 20 days before laying formal charges. If the court rejects the arrest request, prosecutors can still indict and charge her. Prosecutors accuse Park of colluding with a confidante to extort from big businesses, take a bribe from one of the companies and commit other wrongdoings. The allegations prompted millions of South Koreans to stage streets protests every weekend for months before the Constitutional Court ruled to dismiss her on March 10. Park's presidential powers had already been suspended after parliament impeached her in December. It was a dramatic setback to Park, South Korea's first female president who rose to power four years ago amid conservatives' nostalgia for her late dictator father who is credited by supporters for pulling a war-torn country out of poverty in the 1960-70s. Liberal critics revile her father as a ruthless leader who tortured and imprisoned his opponents. Earlier Thursday, hundreds of her supporters, mostly elderly conservative citizens, gathered near her Seoul home, waving national flags and chanting slogans when she left for the court. Prosecutors say they want to arrest Park because her alleged crimes are "grave" and other suspects involved the scandal, including her confidante Choi Soo-sil, have already been arrested. Park and Choi deny most of the allegations. Park has said she only let Choi edit some of her presidential speeches and got her help on "public relations" issues. Choi made similar statements. The women, both in their 60s, have been friends for 40 years. Park once described Choi as someone who helped her when she had "difficulties," an apparent reference to her parents' assassinations in the 1970s. Park's father Chung-hee was gunned down by his own intelligence chief in 1979, five years after his wife was killed in an assassination attempt that targeted him. Park Geun-hye served as first lady after her mother's death. South Korea is to hold an election in May to choose Park's successor.